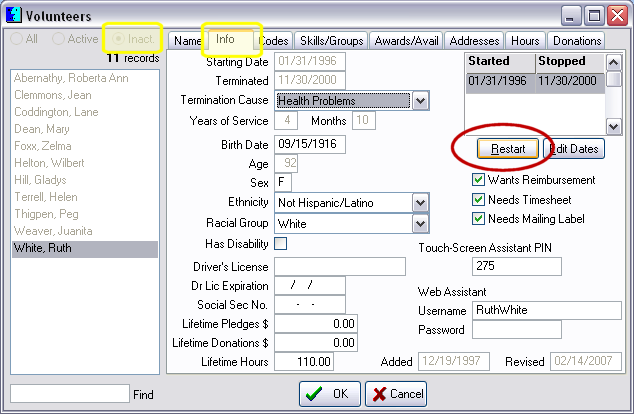 Restarting a Volunteer in version 6.0 is simplified. 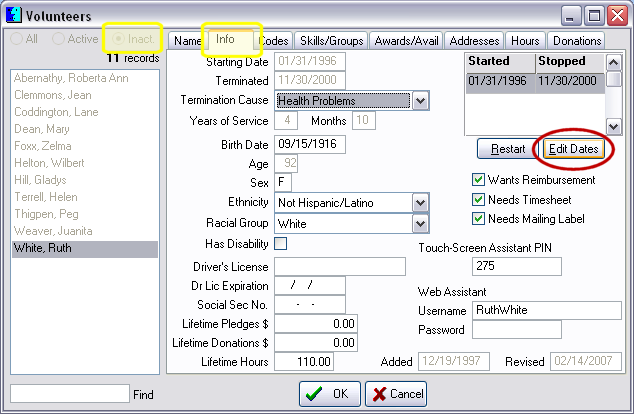 There are a couple of ways to set the dates when restarting a Volunteer in version 5.9. 1. If you click Restart, give a new starting date. This will mean that a person's Years of Service will reflect only the time he or she has been an active volunteer, subtracting the time of absence. This also means that when you go to restart a Placement, you might have a date conflict. If the existing terminated placement has a starting date earlier than the volunteer's new starting date, the Reporter won't let you do it. 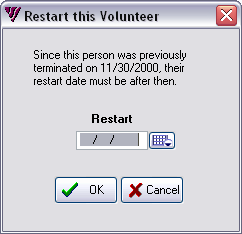 You can remedy that by either editing the volunteer's restart date in the volunteer's record. Or, you can edit the starting date for the placement in Placements. 2. 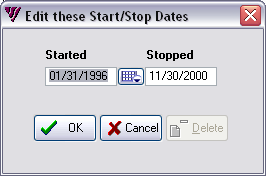 If you click Edit Dates, remove the Stopped date. This results in the volunteer resuming as if he or she never left. This way computes as if the volunteer's Lifetime Hours are continual since the original starting date. 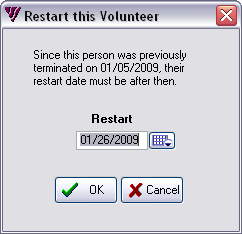 When you click OK to confirm restarting the volunteer, a message usually says, "Since you have restarted this volunteer, do you also want to restart all of this volunteer's job placements?" Restart giving a new starting date. This method leaves a history of stopping and starting, as well as calculating the years of service based on only active time. The volunteer's original starting date remains as the main starting date in the record. 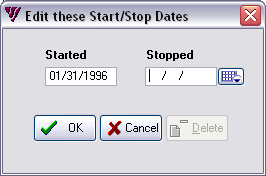 Restart by removing the ending date and keeping the original starting date. Remove the ending date. Just highlight and clear it with the Delete key or use the Backspace key. This method restarts a volunteer as if there was no interruption and calculates the years of service as if there was no time not in service. Restarted volunteers, even those with a new starting date, will not appear on the New Volunteers report if their original start date falls before the time period of the report.